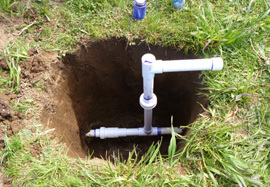 Improving the efficiency of your irrigation system is the most effective way to save energy and water. Incentive programs can help defray the cost of making these improvements. Irrigation scheduling assures that you are applying water based on crop needs. The method we describe tracks water use as you would track income and expenses in a checking account. The water rights section describes the basics and provides links to more detailed information on this complex topic. For help evaluating your system and deciphering the incentive programs, request a site visit.